As with the first Friday of each month, the Bureau of Labor Statistics (BLS) of the Department of US Labor will release tomorrow its report on the employment situation in the US for the month of June. Job creation is expected to have increased by 174,000, with an unemployment rate at 4.8%. The May report surprised markets with only 38,000 jobs created, compared to an expected figure of 159,000. The previous months were also sharply revised downwards. What is the importance of the US employment report? This report includes several surveys that give a vision of the strength or weakness of the employment situation in the United States. Therefore, it helps to have an idea of the strength of the US economy. Thus, investors can deduce how US consumers are going to spend their money, and if companies are investing or hiring, which contributes to growth. The US employment report therefore provides extensive information on how the US economy is evolving and in what direction it is going. The NFP report takes into account nearly 80% of the country’s workforce. Thus, if the report is positive, it means that more people have a job and therefore receive a salary, encouraging consumer spending, the main factor in US growth (60% of GDP). Similarly, if employment increases it means that businesses face greater labor needs because they have more orders or are confident in the future of their business. Watching the evolution of hourly wages in the US is also an important point for inflation. As consumer spending increases through higher salaries, so the demand for a good may exceed supply and lead to higher prices. If wages rise, goods will be more expensive to produce, as the factors of production have increased. Thus, companies may decide to pass this increase onto the final sale price of the goods. What is the relationship with US monetary policy? 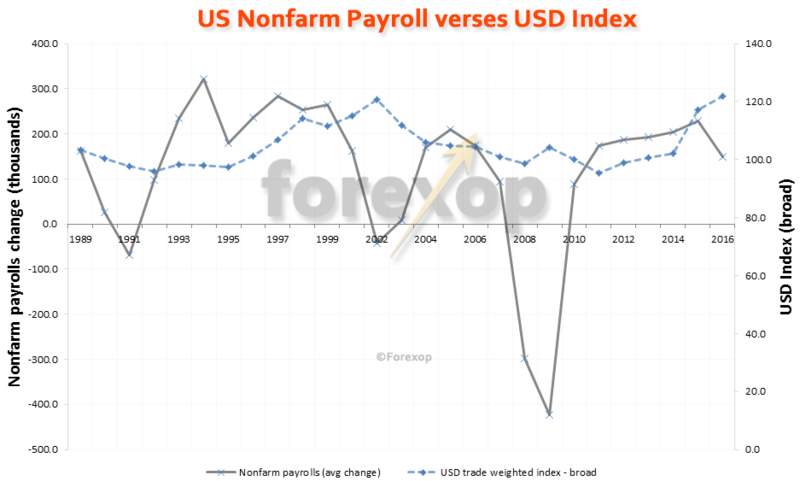 The report of US employment is heavily monitored by investors to determine how the FED can interpret these data and modify its monetary policy in response. The FED has a dual mandate of full employment and inflation at around 2%. Thus, this report provides important information about the strength of the US job market, as well as information on a possible wage inflation. While important, this report should not change investors’ expectations vis-à-vis the pace of rising interest rates in the United States. Only 19% of investors anticipate a rate hike before December 2016. In fact, the latest employment report showed a slowdown in hiring, not to mention the low level of business investment, which affected the US economic outlook even before the referendum on the Brexit. At the FOMC meeting of the June, the FED left its monetary policy unchanged. However, the FOMC participants specified that they still plan two rate hikes this year. Indeed, the FED does not rule out the possibility that the labor market will improve and that May’s slowdown in hiring may be only temporary…To be continued tomorrow.